Jenny Watsons paintings draw together the complex and humdrum elements of everyday life. Taking her Australian suburban childhood as a main point of departure, the paintings presented in Girls exhibit an uncompromising examination of human nature and a struggle to display a multifaceted, but complete personal identity. Contrasting family dramas and childhood daydreams with place names, lists of food and overheard comments, Watson examines the complex desires and realities of everyday living. 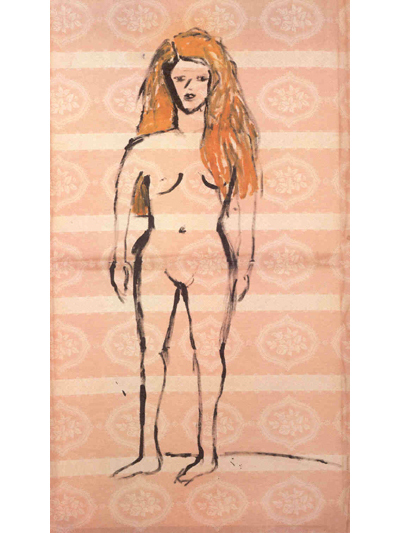 Painting on household fabrics, Watson displays her images with text panels and nick-nacks ranging from toy figurines to horses' tails, to present an archive of memories and concerns. The domestic fabrics and china figures seem to represent a nostalgic and comforting past. In her texts and painted imagery however, Watson manages to project a dark sense of humour and a knowingness that belies the works' apparent naivety. Whether the relationship between text, image and object is immediately obvious or not, is not Watson's main priority. What is at stake in our reading of her work is our ability to recognise the multiple conscious and subconscious narratives working simultaneously. This multiplicity in Watson's painting enables her to tackle subjects as diverse as the status of the female artist, childhood heroines from Cinderella to Ophelia, family relationships and pop music. The paintings presented in Girls acknowledges how Watson's examination of these themes has developed over the past two decades without losing focus. The multiple narratives of her paintings may be difficult to pin down, but are steeped in artistic and cultural references. 'Lady down on her Luck', for example, may be seen as a sequel to Manet's infamous Olympia(1865), complete with startled cat, whilst Watson's preoccupation with the status of female artists suggests an alternative reading of the economically and socially impoverished female painter as seen in Emily Mary Osborn's 'Nameless and Friendless'(1857).